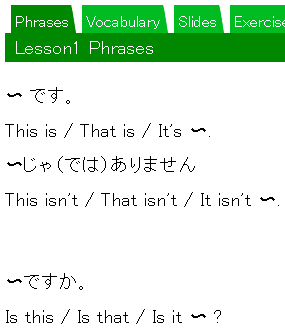 This is a website where you can study all aspects of beginner-level Japanese grammar. Starting with basic words and expressions, you can study here with grammar explanations that make use of simple slides to help you understand, various questions or pieces to read, worksheets and kanji study too. There are 50 beginner-level grammar lessons, with grammar, vocabulary and kanji matching those from the textbook "Minna no Nihongo". Each lesson is composed of the following: text (sentence pattern), phrases (vocabulary, expressions), slides (grammar explanations), exercises, worksheets (PDF), kanji and kanji exercises. 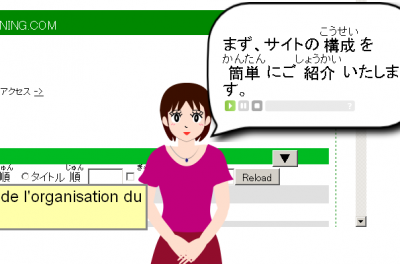 There are three display languages to choose from: Japanese, English and French. 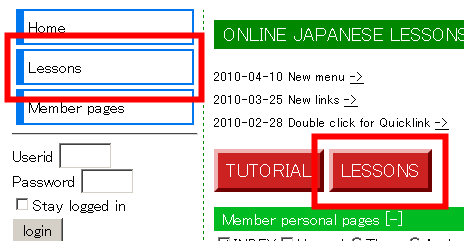 Choose Japanese as the display language and you can also attach ruby furigana to the text. 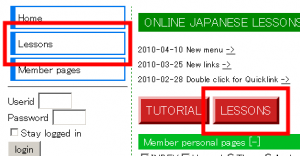 There is a function that allows you to read the Japanese text on the main site with furigana, or to attach furigana to any Japanese text copied and pasted from other websites. 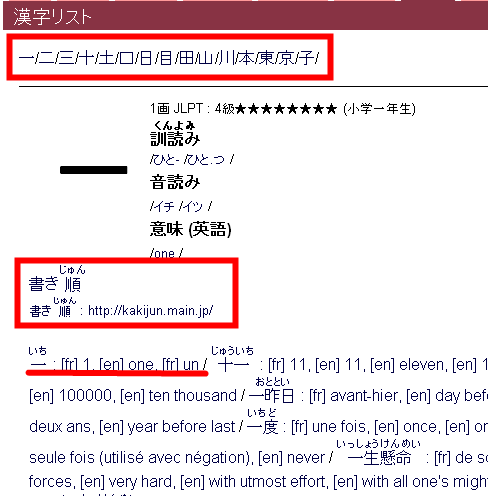 There are dictionary and kanji dictionary functions. You can switch the display between 3 languages: Japanese, French and English. If you choose Japanese, you can attach furigana to the kanji characters. When you do this, you can select the level of kanji you wish to display furigana for using the '漢字レベル' option. Read 'テクニカルノート (Technical notes)' from 'はじめに (Start here)' and check your operating environment. There you'll find is a detailed explanation about internet browsers. 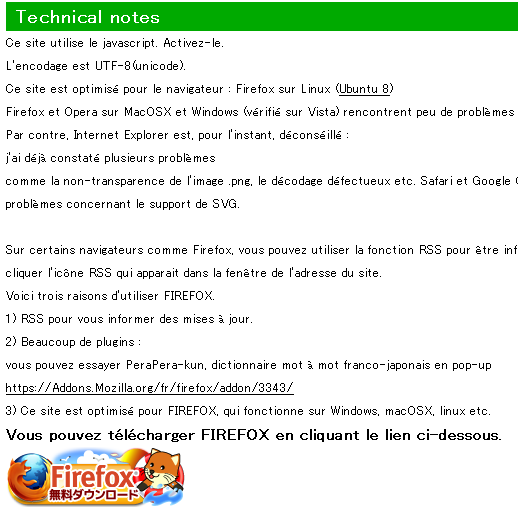 The browser which the site recommends you use is Firefox, by Mozilla. These buttons form a quick menu. 'あ': A hiragana chart will be displayed. 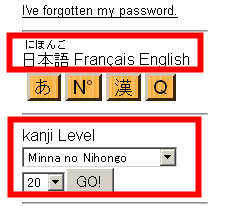 Students who don't know the kana well enough can click on this button and have the chart conveniently open up in another window. 'N': A window with details of numbers in Japanese will open. '漢': A list of kanji for each lesson in the textbook "Minna no nihongo" is shown, and you can take quizzes. 'Q': You can try quizzes based on the lessons on this site. You can hear audio for the Japanese explanation. 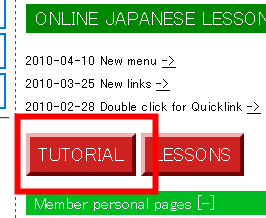 To start the grammar lessons, click on the 'レッスン (Lessons)' button found either at the top left, or at the centre of the screen. The lessons are organised as shown in the next screenshots. There are 50 lessons in total. A list of sentence patterns for the lesson you are studying is introduced in the '文 (Phrases)' section. There are quizzes to check your understanding in the 'ことば (Vocabulary)' section. 'スライド (Slides)' is one of this site's special features, with slides including carefully explained commentary on each lesson accompanied by illustrations. If there are a large number of slides for one lesson, it may take a little time for all the data to be read. Practice questions for lessons studied. In the 'よみもの (Reading)' section you are given a short piece of writing to read and then answer some questions on, to help you understand the content. The 'プリント (Print) ' section includes PDF files of worksheets that you can download and print out for later, to review offline what you study on the website. In the 'かんじ (Kanji)' section, alongside a list of the kanji studied in the lesson, you can also find commentary and some kanji vocabulary for each character. You can also see how to write each character by clicking on the link under 'Stroke order', which takes you to an external site. The meanings are shown in both English and French. Click on a kanji vocabulary item and you will be taken to this site's database, where you can look up some information on the kanji. In the 'かんじもんだい (Kanji exercises)' section, you can try some practice questions for the kanji found in the lesson. You can choose to look at either the reading or the writing of the character. The order in which the kanji are presented is random, so you can check your understanding as many times as you like. Aside from Japanese learning, there are plenty more convenient tools here. These include dictionary functions, a sentence pattern search, and a tool for attaching furigana to kanji. To use the '例文 (Example sentence)' function, first try entering a sentence pattern into the box. 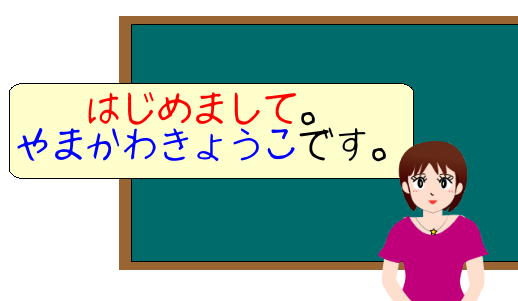 For example, enter the structure 'じゃありません' that you study in Lesson 1 and all the lessons and example sentences which use that pattern are shown.